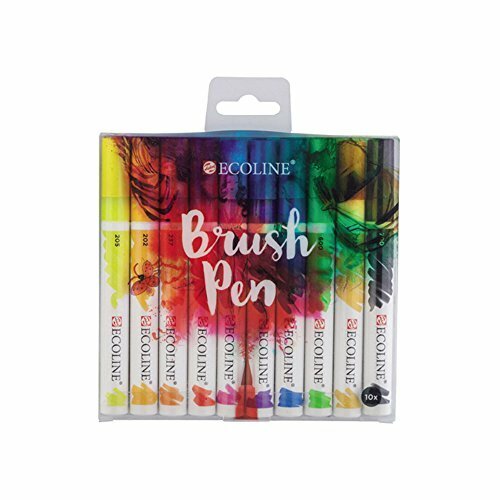 This set of 10 Ecoline Liquid Watercolor Brush Pens turns Ecoline's popular paints into easy to use markers perfect for making precise lines, dynamic strokes, or coloring in - wherever you're working. They dry fast and are easy to dilute and blend, even re-wet, with water or the blender pen (sold separately). Each colors is consistent across Ecoline's ranges and the set is based around subtractive primaries cyan, magenta, and yellow to integrate with hybrid-digital approaches. Other colors include black, green, deep orange, scarlet, blue violet, and ultramarine. If you have any questions about this product by Ecoline, contact us by completing and submitting the form below. If you are looking for a specif part number, please include it with your message.